Photo taken by Kirsten Fenn. On the corner of Lisgar and Elgin streets in downtown Ottawa, a group of twenty-or-so people has gathered in the cold. They stand bundled in jackets and scarves as the morning sun peeks through the square frame of the Human Rights Monument, providing some relief from the frigid November air. A woman in jeans and a black jacket stands at the steps of the monument and the group’s attention shifts to her. Talking with one hand outstretched and a cup of tea in the other, she welcomes them and acknowledges their presence on unceded Algonquin territory. “We’ll start first of all inside this wonderful monument,” she says, inviting them to follow her up the steps and discover what’s beyond the red structure. Mounted overhead are the words “dignity,” “equality” and “rights.” Inside, the three words are engraved on square tiles that cover the walls. “In here, there’s 73 different plaques with different Indigenous languages,” the woman says, pointing to words written in Micmac, Inuktitut, Cree. She herself is Apeetagosan-Nehiyaw (Métis-Cree), from Lac La Biche, Alta. These words, she explains, tell a story about the diversity of Indigenous nations across Canada — land they call Turtle Island. But the words are not the only story. 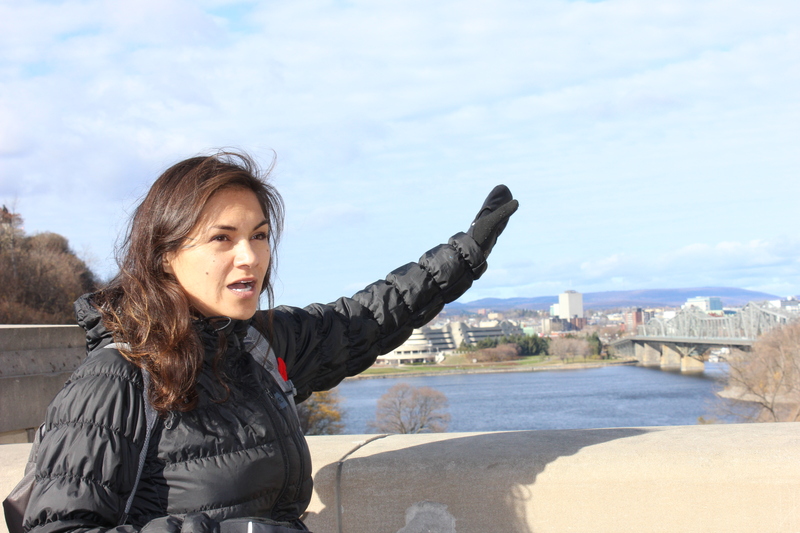 They’re one of many on artist and educator Jaime Koebel’s Indigenous Walk, a guided tour of downtown Ottawa that introduces participants to social, political and cultural spaces from an Indigenous perspective. Here at the monument, today’s group is taking its first footsteps in a learning journey that will bring them to Inuit carvings, totem poles and aboriginal statues around the city. “One thing that solidified my idea to start an Indigenous walking tour was to retell our stories, or tell them properly, from our perspective,” says Koebel, whose walks touch on everything from Indigenous art to residential schools to missing and murdered Indigenous women. She wants to contribute to a new relationship between Indigenous people and Canada, something she hopes the incoming Liberal government will help foster. Koebel started Indigenous Walks last May after working in aboriginal policy for a number of years, something she says was an emotionally draining way of getting her messages across. When she began giving tours at the National Gallery in 2013, she realized she could address those issues in a more “palatable” way through art and education. The tour Koebel is giving today is part of Spur, a festival of politics, art and ideas held in cities across the country. It encourages Canadians to “reimagine the kind of society they want to live in and work for that change,” says festival director Helen Walsh, who traveled from Toronto to participate in Koebel’s walk. For her, that means a society that celebrates Canada’s full diversity. Koebel’s walk is a reminder that Indigenous people are “an integral part of the fabric of Canada,” Walsh says. It’s a message she hopes Spur’s programming drives home. This year’s Ottawa festival closes with an event on truth and reconciliation. The goal is to encourage the government to adopt the Truth and Reconciliation Commission’s 94 recommendations that resulted from its inquiry into Canada’s Indian Residential Schools. “My father is a survivor of day school,” Koebel tells the group during another stop at the Canada Council for the Arts. She pauses, blinking through tears. Her voice echoes inside the high-ceilinged building as she recounts how her father was forced to kneel in sand all day as punishment for speaking his native language, Nehiyawewin. Despite not being Indigenous, Koebel’s mother raised her daughter around sweat lodges, round dances and Cree culture. Koebel sees it as an act of reconciliation, even if her mother may not have realized it. As an Indigenous person, Koebel says, it means a lot to her that people are expressing interest in learning about these issues through her walks. Sarah Mohr met Koebel a year ago and came to the event to gain a better understanding of Indigenous history through her friend’s eyes. To the left of a leafy path through Major’s Hill Park, the wind makes ripples in the Ottawa River below the Parliament Buildings of Canada. In a tucked-away area of the park, Koebel brings the group to its final stop at the statue of the Anishinabe Scout. It was originally placed at Nepean Point, keeling beside the statue of Samuel de Champlain. When members of the Indigenous community pointed out that he appeared subservient to Champlain, it was moved to its current location. A few years ago, Koebel and her kids took part in a ceremony to give the statue an aboriginal name and celebrate the history he represents from an Indigenous perspective. Standing on a rock beside the statue, Koebel thanks the group for choosing to walk with her. “I say Hiy Hiy, thank you,” she says. If you’d like to learn more about Jaime Koebel’s Indigenous Walks and her tour schedule, you can visit her website at: http://indigenouswalks.com/ .